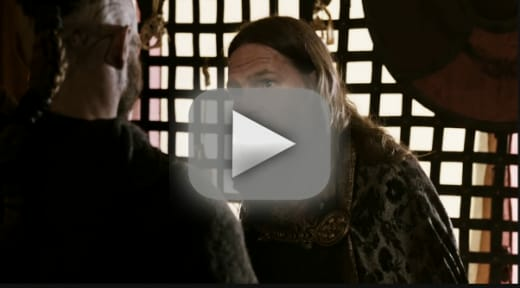 On Vikings this week, Ragnar and King Horik don't exactly see eye to eye and Jarl Borg will pay the price for it. 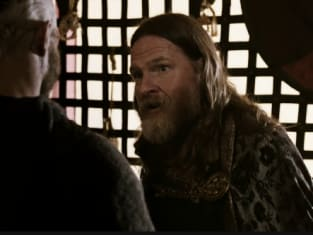 Did he really think Ragnar would forgive and forget so easily? Meanwhile, Athelstan and King Ecbert bond over Roman art. Athelstan will preserve Ecbert's Roman parchments or suffer crucifixion again. Lagertha settles an old score with husband number two, Earl Sigvard, and young Bjorn falls for a slave girl. I've chosen you to be the guardian of these books and their secrets. I want you to copy them. Permalink: I've chosen you to be the guardian of these books and their secrets. Bjorn: What if I ordered you to stay here? Porunn: Then I would have to heed your command. Bjorn: I don't want to order you. I want you to choose to stay here. Permalink: I don't want to order you. I want you to choose to stay here.